Janice H2O Color: N- "Not a Place I Would Hang Out!" David and I went out for a drive one day and we passed the Coyote Bait Shop. It looks as though parts of the building were added at random. 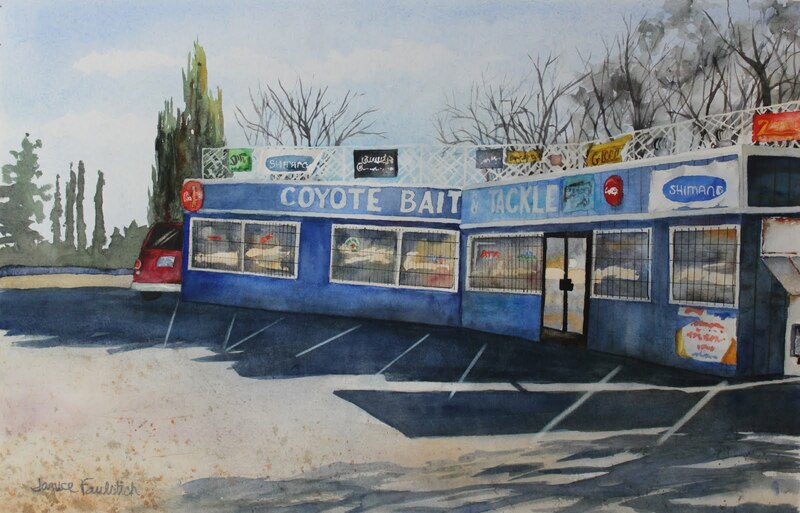 There are elements of this painting that worked out really well-the trees and the bait machine at the far right-but I seriously overworked the blue of the building and used more mask than I would have liked, so I've begun doing this one again. Wowie Janice, this is fantastic and the technical execution is amazing. All the reflections in the windows, wow! the wording on the signs, wow!, the shadows, wow!, I'm just amazed at it and so proud of you! Thanks, Sheila-but in person, it needs work-or rather less work-I'm gonna try it again.